We are now seeking participants for Awaken the Dragon 2014. Attend our workshop, learn more about ceramics and the dragon kilns, as well as create your own clay work! 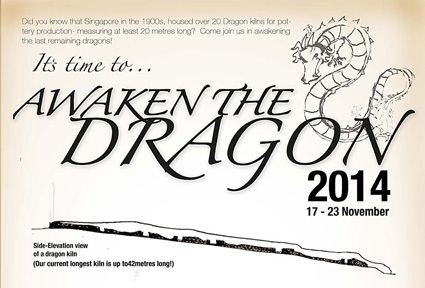 Your artwork will, with about 3,000 others, be fired in the dragon kiln for the largest ceramic firing in Singapore, during the Awaken the Dragon Festival (17-23 Nov). After the firing, there will be a public exhibition of all the clay works. At the end of the exhibition, you will get to keep your work. Join us for this very special experience! Participation fee is $25/pax and each workshop is about 1.5hr. More info at http://www.facebook.com/events/235561176644339/.